Looking for a Used Sonic in your area? CarGurus has 7,264 nationwide Sonic listings starting at $1,200. The Chevrolet Sonic subcompact car, which makes its debut for 2012 as a replacement for the retiring Aveo, runs with the class leaders when it comes to exterior styling, performance, handling, roominess and cargo space. 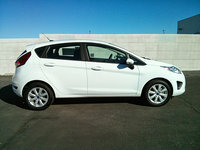 Some owners report they're not getting stated fuel economy numbers out of their 2012 Sonic, while others say their vehicles exhibit a certain amount of sway on the road, which often gets attributed to the Sonic's tires. With its new Sonic subcompact vehicle, Chevrolet takes aim at such class competitors as the Honda Fit, the Ford Fiesta, the Hyundai Accent and the Mazda2. Aggressive styling helps the Sonic stand out in a crowded field, while an available turbocharged powerplant provides peppy performance. Chevy even brought in the Corvette team to design the Sonic's suspension, resulting in agile handling. Add in such features as a 6-speed transmission, heated front seats and an available sunroof, as well as a roomy, well-equipped cabin, and it's clear the Sonic can play with the class leaders. The subcompact class has been on a tear lately, as consumers search for economical daily commuters without giving up the amenities they desire. With the Sonic, Chevy is letting buyers know that it's serious about delivering what they're seeking. Built in Detroit and wedged between the diminutive entry-level Spark and the compact Cruze in Chevy's lineup, the new Sonic subcompact vehicle sure seems like a winner, thanks to its aggressive good looks, agile handling, available turbocharged powerplant and well-equipped interior. Gone are the staid, bland designs and underwhelming performance of the Aveo, which the Sonic replaces. In fact, in just about every way, Chevy's new subcompact outshines the Aveo, offering more power, improved styling, a roomier cabin and better functionality. Available in both 4-door sedan and 5-door hatchback body styles, the 2012 Sonic comes in base LS, mid-level LT and top-shelf LTZ trims. 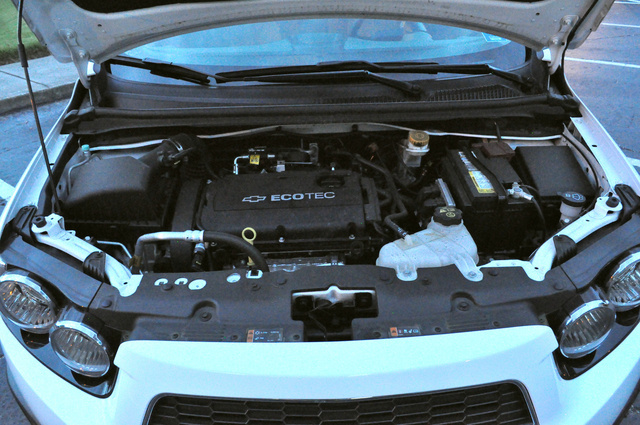 A 1.8-liter Ecotec 4-cylinder engine provides standard power, but buyers can opt for a torque-happy 1.4-liter turbocharged Ecotec 4-cylinder, which is optional for the LT and LTZ. 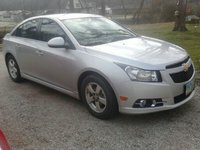 Both engines put out 138 hp, and both were borrowed from the larger Cruze, providing a better weight-to-power ratio in the smaller Sonic. Chevy has gone to great lengths to make the Sonic stand out in a crowd, starting with its exterior design. Aiming for a fresh, aggressive appearance, the automaker gives the Sonic a wide, planted look by pushing the wheels out to the far corners, which also helps improve stability and handling. Up front, a dual-element grille features the Chevy bowtie prominently displayed in a center strip. The headlights were inspired by a motorcycle design, according to the automaker, and the sculpted hood leads back to a sharply raked windshield and low, tapering roofline. Prominent fender flares, a rising sideline and round taillights are among the Sonic's other styling cues. Upper-level trims receive foglights and heated power-adjustable exterior mirrors. The Sonic hatchback displays a slightly more aggressive look than the sedan, thanks to a standard integrated rear spoiler. The sedan version measures a few inches longer than the hatchback, but besides more cargo space, the hatchback offers a few additional inches of rear-seat headroom, thanks to its boxlike design from the front pillars to the rear bumper. Both sedan and hatchback come prepared to party, however, and Chevy has raised the bar quite a bit with its attractive, powerful and nimble new subcompact. 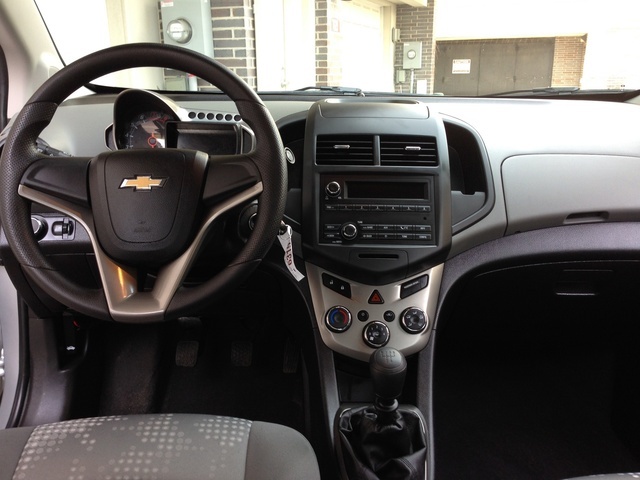 Chevy offers the Sonic with a choice of 2 engines and 3 transmissions. Standard power comes from a 1.8-liter Ecotec 4-cylinder engine with variable valve timing. Producing 125 lb-ft of torque, it links to either a 5-speed manual transmission, which comes standard on the LS, or a 6-speed automatic transmission, standard for the LT and LTZ trims. The base powerplant posts respectable fuel economy numbers of 26 mpg city/35 highway with either transmission. The available turbocharged 1.4-liter Ecotec 4-cylinder engine puts out the same amount of horsepower, but torque increases to 148 lb-ft over a wide rpm range, resulting in peppy acceleration and a spirited ride. Chevy equips the turbo with such upgraded features as a reinforced crankshaft and stronger connecting rods for solid performance as well as lower emissions. Buyers can pair the turbo with either the 6-speed transmission or a 6-speed manual shifter. Despite the sportier performance, the turbo posts impressive fuel economy numbers, which check in at 29/40 with the manual shifter and 27/37 with the automatic. While both engines provide good performance, most testers say they won't blow off anyone's socks. However, they're solid powerplants and certainly make the Sonic competitive in the class. Naturally, the turbo comes well-recommended by reviewers, since it delivers stronger acceleration and peppier performance, while at the same time its fuel economy numbers are better than the base 4-cylinder's. By bringing in the Corvette engineering team to design the Sonic's suspension, Chevy ensured the subcompact's ride and handling would match or exceed that of its closest competitors. The goal of the Corvette team was to deliver an athletic feel, with good response and balance over a wide range of road surfaces and conditions, according to the automaker. To ensure optimal handling, the Sonic features a stiff body structure, which enabled the engineers to tune the suspension for a firm ride and a precise feel. Early testers say the designers largely succeeded, since the Sonic delivers a smooth, capable ride with minimal noise, vibration and harshness. Most reviewers say the Sonic's ride and handling match the best in its class, although a number of reviewers point out that the Sonic is prone to understeer, meaning it takes a wider arc in tight turns than the driver intended. Overall, most testers say they like the Sonic's ride and handling and consider it on par with class leaders like the Honda Fit and Mazda2. The Sonic rides on a MacPherson strut front suspension with coil springs and a stabilizer bar, and a torsion beam, semi-independent compound link-type configuration in the rear with gas-charged shocks. Electronic power steering delivers tight control, especially when taking corners at speed. Disc brakes come standard in the front, while the rear gets drum brakes. The LS and LT ride on 15-inch aluminum wheels, while optional 16-inch wheels are available for the LT. The LTZ gets 17-inch aluminum wheels, with a number of available upgraded 17-inch wheels. 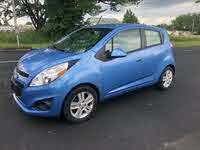 Like its powerplants, suspension and exterior styling, the Sonic's cabin goes against the typical subcompact grain. Although it's hardly plush, it's well-designed and practical, with numerous storage spaces and a strong list of standard features. 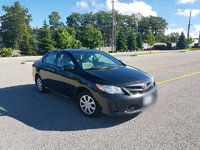 Passengers will find plenty of legroom and headroom in both the front and second rows, while the hatchback offers slightly more interior roominess than the sedan. Taller adults should easily fit into the rear seats, and all passengers will find it easy to enter and exit the cabin. The seats are comfortable enough for long-distance travel, with the LS receiving sport cloth upholstery and the LT featuring upgraded deluxe cloth seats. The LTZ gets perforated leatherette seating surfaces and heated front seats. Chevy does not offer leather upholstery in the Sonic. All trims feature a 60/40-split flat-folding rear seat. With the rear seats up and in place, the Sonic Hatchback offers a respectable 19 cubic feet of storage space in the cargo area, which expands to 47.7 cubic feet with the rear seats folded down. By comparison, the Mazda2 hatchback offers 13.3 cubic feet of cargo space, which expands to 27.8 cubic feet, and the Ford Fiesta offers 15.4/26 cubic feet. At the top of the heap, the Honda Fit delivers 26 cubic feet of cargo space behind the rear seats, which expands to a whopping 57.3 cubic feet with the rear seats folded down. For the Sonic sedan, cargo space in the trunk checks in at 14.9 cubic feet. Reviewers find the Sonic's instrument cluster well-designed, with large, round gauges and an LCD display, and overall they like Sonic's interior build quality. Unique features include an automatic shift knob with a cobra-head design, while the manual shifter gets a chrome-finished knob. Other standard features for the entry-level LS trim include air conditioning with an outside temperature display, remote keyless entry, a tilt/telescopic steering wheel and a 4-speaker audio system with an auxiliary input jack. The LS also receives standard OnStar for 6 months, which includes the Directions and Connections plan, as well as such features as turn-by-turn navigation and vehicle diagnostics. Stepping up a notch, the LT also gets power windows and an upgraded 6-speaker audio system with a CD player and SiriusXM satellite radio, while the top-level LTZ adds a leather-wrapped steering wheel, cruise control, remote vehicle start and an upgraded audio system with Bluetooth, a USB port and steering-wheel-mounted audio controls, in addition to leatherette upholstery and heated front seats. Owners can add an optional power sunroof on the LTZ. The 2012 Sonic was named a Top Safety Pick by the IIHS, since it received a top rating of Good for protecting passengers in all types of crashes, including frontal, side, rear-impact and rollover crashes. The NHTSA similarly gave the Sonic an overall safety rating of 5 out of 5 stars, although it received only 4 stars for protecting passengers in rollover crashes. All Sonic trims come well-equipped with a total of 10 airbags, including knee airbags for both the driver and passenger, seat-mounted thorax side-impact airbags and roof-rail head curtain airbags for both rows of seating. Other standard safety features include the StabiliTrak stability control system and traction control, as well as 4-wheel antilock brakes with brake assist and electronic brakeforce distribution. Daytime running lights and a hill hold feature also come standard, while the OnStar system includes such safety features as automatic crash response, crisis assist, emergency services, remote door unlock, roadside assistance and stolen vehicle assistance. While the majority of new owners like their new Sonics, some find a few faults with the vehicle. Owners generally like the Sonic's exterior styling, handling, roominess and interior comfort, as well as its good visibility out the sides and rear. Owners also like the Sonic's instrument cluster and gauges, which they say are easy to read. Negative comments arise, however, over fuel economy and road sway. 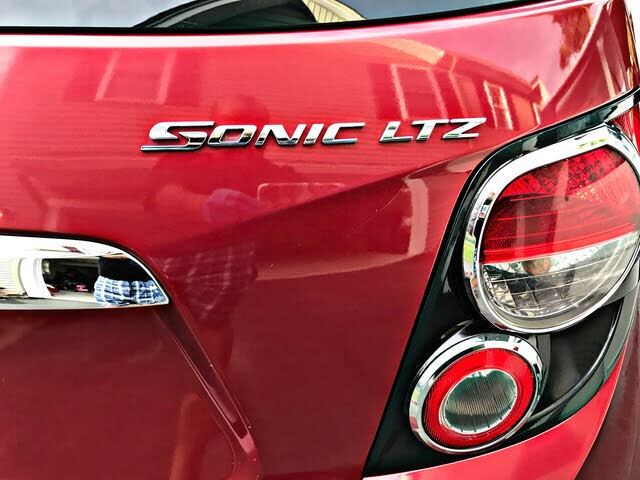 While some owners report getting good fuel economy from their vehicles, others say they're getting poor mileage out of the Sonic's engines, often 5 or 6 mpg less than the stated numbers. In fact, multiple owners report that the Sonic's fuel economy numbers are all over the place. In addition, some owners say their vehicles display a certain amount of sway on the road, which often is attributed to the tires. What's your take on the 2012 Chevrolet Sonic? Guru3CQ3 Just realized my insurance was double of what my son's Camaro is. They say this car is Turbo-charged. Bull. This car has little get up and go for the extra charges. I laughed when the insurance guy told me this. Looking here, I am not sure what they think is turbo charged, but the Sonic is not it. Users ranked 2012 Chevrolet Sonic against other cars which they drove/owned. Each ranking was based on 9 categories. Here is the summary of top rankings. Have you driven a 2012 Chevrolet Sonic? I have both error codes and I was wondering if the same thing could cause both issues? If so how much would it likely cost to repair.